That could worsen the spread of mosquito-borne diseases like malaria, dengue, and Zika. But while not every mosquito carries disease, some do, and that has scientists concerned that climate change may boost the number of mosquito-borne illnesses worldwide. Their concern only increases given that the buzzing bloodsuckers live on most of the Earth’s large landmasses other than, you guessed it, Antarctica and Iceland. Researchers from the University of Bath, University of York, and China Agricultural University recently published a study in Communications Biology explaining how climate change could bring mosquito-borne diseases to areas where these diseases had previously been eradicated and also to entirely new areas. The scientists modeled mosquito speciation rates over the past 195 million years and found a strong correlation between the rate of speciation and levels of atmospheric CO2 and temperature, with faster rates of mosquito evolution when temperatures were higher, and more CO2 was present. New mosquito species would pose more burdens on public health system. Factors that could increase rates of mosquito speciation, including CO2 levels and temperature, may also affect other species – including the animals female mosquitoes feed upon for their blood meals. These species – and their interactions with mosquitoes – could evolve in unknown ways. “Our finding that mammal speciation is linked to mosquito speciation is unsurprising given that mammals are a predominant source of food for many species of mosquitoes,” according to the authors of the Communications Biology study. While some researchers are examining mosquito speciation and evolution on a wide scale, others hone-in on a single deadly mosquito-borne disease: dengue. More than 40 percent of the global population live in areas where they could become infected with dengue, and the World Health Organization estimates 50-100 million people contract the virus each year, with 20,000 people dying of it. Dengue is considered a “climate-sensitive” disease since rates of the virus are linked to mosquito density, which is affected by temperature and precipitation. Nils Stenseth, professor of ecology and evolution at the University of Oslo, and a number of researchers from other institutions, published their findings on dengue outbreaks in PNAS in February. Their goal: see if they could use climate data to predict outbreaks in a region of southern China. This area recently had suffered from “unprecedentedly severe dengue outbreaks,” the researchers wrote, adding that China’s Guangdong Province had 45,230 cases of the disease in 2014 alone. In many parts of the world, old city centers where people live are located near ponds, parks, and other areas that mosquitoes find much to their liking. Stenseth says proximity between human habitation and mosquito habitat is particularly concerning given that warm, wet conditions lead people to leave their windows open, providing more opportunities for bites … and infections. The team examined a decade’s worth of data, looking at mosquito abundance, temperature, and precipitation. They noted mosquito incubation is related to temperature, and found more mosquitoes between July and October, with a peak in August, though those peaks clearly vary by specific location. 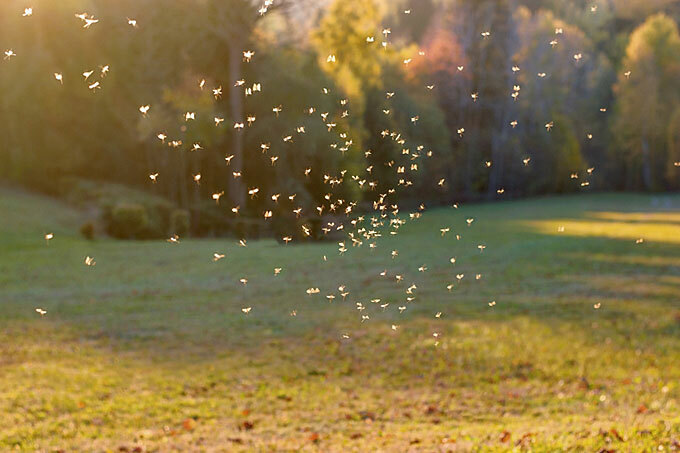 They reported a one-month lag between weather conditions and the abundance of adult mosquitoes. Using data from 2005 to 2014 to train their models, the researchers were able to accurately predict 2015 mosquito population figures. They concluded climate was the key factor driving the numbers. It may be tempting to leap to wide-ranging conclusions based on this study, Stenseth said, but he cautions people to avoid extrapolating the findings to other regions and diseases because a variety of other factors may also contribute to infection rates. “We should be very careful about taking a model that is fitted to data in one particular place and generalize that to be applicable all over,” Stenseth says, adding that the approach itself is applicable more broadly. He says he plans to continue researching how climate change affects mosquitoes and other vector-borne diseases. Kristen Pope is an Idaho-based freelance writer who frequently covers science and conservation-related topics.